1. Preheat your oven to 400ºF (200°C). Trim the bottom of the cauliflower and remove all the leaves and the stem, but without breaking apart. Give it a quick rinse and pat dry. 2. Place the whole cauliflower in a pot and cover with stock, add fresh thyme and bay leaf. Bring to a boil and simmer for 12 minutes. 3. 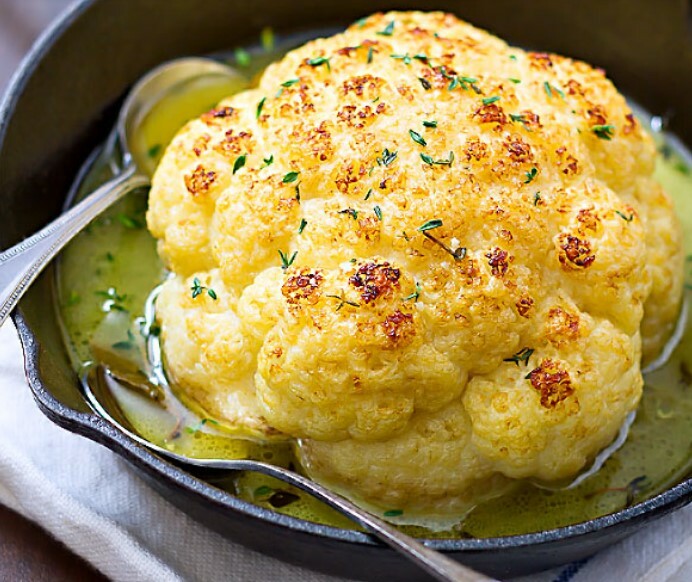 Drain and transfer the cauliflower head in a cast iron skillet or any oven proof pan. Ladle a little of the cooking stock over the cauliflower then drizzle with melted butter on top. Sprinkle with fresh thyme and pepper. 4. Roast in the oven for 10-15 minutes, depending on the size of your cauliflower, until golden. Baste with cooking juice from time to time. Check with a knife, if it slides in easily, then it’s cooked. You can broil for an extra 2 minutes if you want to give it a bit more color, but keep an eye on it so it doesn’t burn. 5. Remove from the oven and sprinkle with fresh thyme. Slice, and serve with an extra drizzle of the buttery cooking juices. Note: For a smokey non-vegetarian version, add crumbled bacon on top of the roasted cauliflower. I am a huge fan of dinners that are quick, easy, and don’t involve a last-minute trip to the grocery store. This spicy (vegan!) jambalaya definitely falls into that category. I grew up on jambalaya that was loaded with shrimp, chicken, and andouille, but when I went vegetarian I had to improvise a bit. Turns out jambalaya is just as good without the meat and fish! Even now that I’m back to being an omnivore, this recipe is still one of my favorites for a quick dinner or a Meatless Monday dish. This jambalaya has a nice kick to it - use more or less jalapeño and paprika depending on how spicy you like things. Add cooked shrimp or andouille to make this a heartier meat dish. After some trail and error, I finally got the hang of it, and now mangos rock my world! For those of your still scared of the fresh mango, Mango.org gives you all the “how-tos” and steps Also check out your local store for frozen mango chunks, they are all ready to hop into your blender for smoothies like this! Now on to the smoothie! This fun combo of banana and mango will surely have your taste buds doing a happy jig! So sit back, chill out and enjoy this tasty smoothie all summer long! We’ve gotten into the habit of making homemade coconut milk, which is very easy to do with a high-powered blender. Most packaged coconut milk contains additives, so we feel better drinking a homemade version made with just coconut and water. It only lasts for a few days, though, and this pudding recipe is a great way to use it while it’s fresh. The trick to making chia coconut pudding without clumps is to whisk the seeds into the coconut milk slowly and stir periodically. The pudding starts to thicken after a few hours, but you’ll want to refrigerate it overnight for the best results.The flavor of this pudding is absolutely delicious, but you can play with it to come up with different combinations. A little cinnamon or lemon zest would make wonderful flavors, too. In a large bowl, whisk together the coconut milk, maple syrup, and vanilla extract. Slowly whisk in the chia seeds. If you pour them in quickly, they’ll clump. Stir every few minutes for the first ten minutes, then refrigerate the mixture. Let it thicken for at least 3 hours, or as long as a few days. 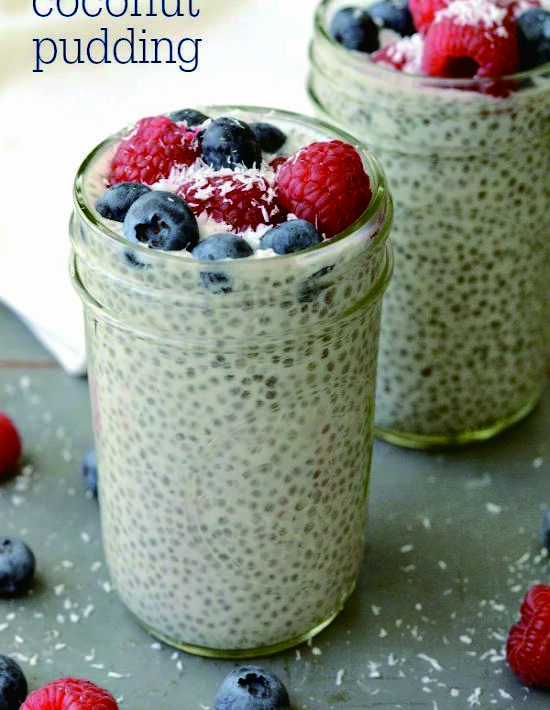 When ready to serve, divide the chia coconut pudding into 3 bowls or jars, and top with berries. I love trying new foods, flavors, and recipes, but I also love and appreciate the basics. You know, the foods you crave on a regular basis and the recipes you make over and over again. The classics, the staples, the every day good food. The food that feels like home. A few of my standards include: oatmeal, peanut butter, banana, and honey sandwiches, cottage cheese with fruit, pasta, cereal, and Avocado Toast with Eggs, Spinach, and Tomatoes. These are my go-to’s! I never get tired of these foods and could eat them every single day…and most days I do! Sure, we love to cook and create new recipes, but you can’t beat the basics. What are your basics? Spray a small skillet with non-stick cooking spray. Add the shallot and spinach and cook over medium heat until spinach is wilted. Place in a small bowl and set aside. Spray the pan again. Pour beaten egg whites or egg into the pan and season with salt and black pepper, to taste. Cook over medium heat until soft-scrambled, about 2 minutes. Mash the avocado with a fork and spread evenly on piece of toast. Top the avocado toast with spinach, scrambled eggs, and tomato slices. Season with salt and pepper, to taste. Serve immediately. Note-to make this gluten-free, use gluten-free bread.